Shell volunteers who take part in Earthwatch’s global research and conservation projects do so for up to two weeks at a time, making important contributions to conservation along the way. Through this program, Shell staff are exposed to a broad range of critical conservation challenges, which are of relevance to Shell’s business, for example, by exploring the impact of climate change at the Arctic's edge. 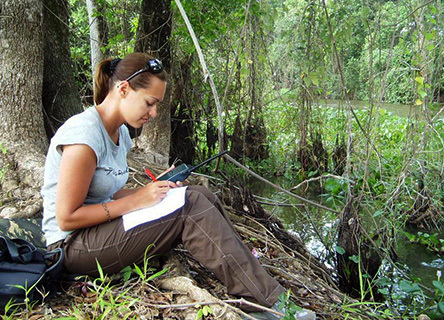 Earthwatch has partnered with Shell for over a decade on an employee engagement initiative that today supports scientific research and learning programs part of Project Better World. Investigating and solving pressing environmental issues. Shell employees often have a life-changing experience and leave with an increased awareness of the importance of solving pressing environmental issues. Shell and Earthwatch have been working together for almost 10 years, through Shell's Project Better World initiative, which is an internal, volunteer-led initiative that educates and involves Shell staff in environmental projects and issues. A number of years ago, a small group of young Shell employees wanted to find ways to make their company’s core values and sustainability objectives more real in their life and work. They created Project Better World, an initiative managed voluntarily by Shell employees. The Earthwatch employee engagement program soon became a cornerstone of this initiative. Initiated in 1999, when 24 Shell employees participated in Earthwatch research projects, Project Better World has since involved more than 500 employees. The program has engaged Shell employees from almost 50 countries on 50 projects; together they have contributed more than 30,000 hours to crucial data collection and conservation work around the world. 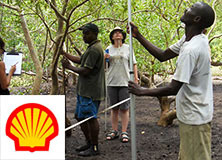 The learning journey for Shell employees begins with a competitive application process in which they are asked to look at how the experience will affect their personal and professional development, but also to explore environmental initiatives that they can start up in their workplace and community afterwards. 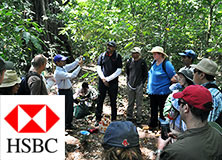 Successful applicants have to complete a number of activities before joining an Earthwatch project: discuss and approve learning objectives with their line manager (linked to Shell’s internal leadership development framework), complete an online study course, attend a workshop, and develop awareness of sustainable development or environmental initiatives already in place within Shell. The applicants will consider various key environmental agendas, assess Shell’s role within these agendas, and make new connections with key personnel in their workplaces. Once on the Earthwatch project, they will be exposed to new ways of thinking and other participants from diverse backgrounds. 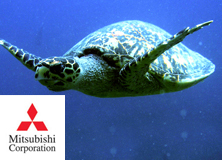 They often have a life-changing experience and leave with significantly increased awareness of the complexities around investigating and solving pressing environmental issues. The employees transfer their knowledge to colleagues and begin their journey as environmental change ambassadors within Shell and their community. Shell is also supporting a five-year program of environmental research through the Earthwatch project Climate and Landscape Change in Borneo’s Rainforest, which commenced in 2009 and finishes in 2013. Earthwatch is coordinating an integrated program of research based at the Danum Valley Field Centre in Sabah, Malaysian Borneo, investigating the impacts of climate change on the rainforest ecosystem. To reverse the degradation of this pristine rainforest, it is essential that we assess and mitigate the impacts of climate change on this ecosystem and its key components. Effective forest restoration plans must be initiated to maintain biodiversity and forest health. 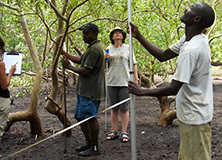 The goal of the research team is to assess and understand the complex interconnected patterns of biodiversity, ecosystem function, and capacity for regeneration and restoration in degraded forests, remaining forest fragments, and oil palm plantations. The project is supporting three complementary and, where practical, integrated Ph.D. studies. 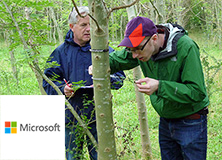 Each year, the postgraduate students will work alongside more than 60 Earthwatch volunteers, including Shell employees, to gather the large amounts of data required to produce meaningful results. The program will also engage local stakeholders and emerging scientists from the region, enabling them to build their field research skills and regional networks through participation on the project. Currently 201 natural World Heritage Sites have been identified as places of outstanding universal value, ranging from the Amazon Rainforest to the Great Barrier Reef. Each site faces its own unique set of pressures from both conservation and organizational management perspectives. This is exactly where Earthwatch’s Business Skills for World Heritage program comes in, transferring the business and organizational management expertise of Shell employees across to the conservation sector. Students and Shell employees gather large amounts of data required to produce meaningful results. Employees begin their journey as environmental change ambassadors within Shell and their community.